A large majority of Winnipeggers do not want to reopen Portage and Main to pedestrians, according to a poll commissioned by CBC News. A Probe Research survey conducted during the final week of August suggests 67 per cent of Winnipeggers oppose the idea of reopening the city's most famous intersection, versus 33 per cent who favour the idea. The results strongly suggest a plebiscite about removing the pedestrian barricades is bound to fail on Oct. 24, when the city holds its civic election. "The data shows Winnipeggers really don't like this idea of opening Portage and Main to pedestrians. There is no demographic — not young people, not downtowners, not downtown residents — who want to open the intersection," said Mary Agnes Welch, a senior researcher for Winnipeg-based Probe. "There is broad and deep, intense dislike for this idea." 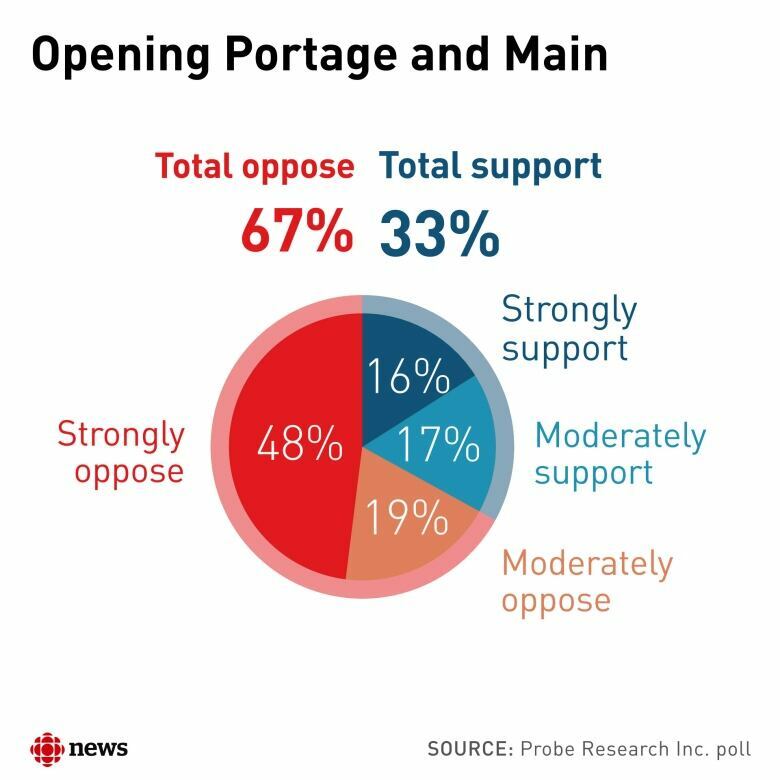 The Probe Research poll of 600 Winnipeg adults, conducted online with a pre-selected panel between Aug. 27 and 31, found support for reopening Portage and Main has dropped to the lowest level in the 20 years the firm has tracked public opinion on this topic. In 1997, a Probe Research poll found 36 per cent of respondents wanted to reopen the intersection, which was shuttered to pedestrians in 1979. Support for the idea climbed in small increments over the decades to 42 per cent in 2016, before crumbling to 33 per cent this August. The poll was weighted to reflect Winnipeg's age and gender demographics and has a margin of error of four per cent. Welch surmised the precipitous drop in support over the past two years is due to city hall making actual plans to reopen the intersection. "Now, we're actually talking about this in a real intense way. This could really happen. But also, some more detail has come out about how much it would cost and what some of the traffic delays might actually be," Welch said. A 2017 Dillon Consulting study concluded it would cost the city $6 million to physically reopen the intersection, plus another $5.5 million to purchase more Winnipeg Transit buses to compensate for afternoon rush-hour delays. "I think that has maybe shifted public opinion away from this slow increase in 'We like this idea,' to 'Yeah, we don't really like this idea," Welch said. Another possible factor in the decline in support may be the intensity of the debate over the subject. Probe Research found 76 per cent of respondents agreed with the statement, "I'm tired of hearing about Portage and Main" even though 54 per cent of survey participants said they were talking about the issue with friends and family. "This is classic Winnipeg, in my view," Welch said. "People say they're totally fed up with the issue. They don't want to talk about it any more, but when we ask them, 'Are you talking about it with friends and family?' Yeah, totally talking about it with friends and family." The Probe Research poll found the three main reasons Winnipeggers oppose reopening Portage and Main are traffic snarls, the cost of the project, and the potential for collisions between cars and pedestrians. The survey also found 66 per cent of Winnipeggers agreed with the statement "smooth traffic through the downtown is more important than pedestrian access," while 65 per cent agreed with the statement "those who want to reopen Portage and Main are out of touch with the concerns of ordinary Winnipeggers." Judy Lutz, who has lived downtown for 30 years and works downtown in the financial industry, is among the Winnipeggers who want to keep the intersection closed. "I was living when Portage and Main was open. It was a nightmare. This is absolute stupidity," Lutz said Tuesday of the idea of reopening the intersection. "You want to cross Portage and Main? Walk a block. Like, walk 50 feet." The poll suggests the three main reasons Winnipeggers want to reopen the intersection are concerns about accessibility for people in wheelchairs, the need to design downtown for pedestrians as well as cars, and concerns about the safety of the underground concourse and stairwells. Vote Open, the group of Winnipeggers campaigning to remove the barricades at Portage and Main, has been trying to promote the idea that reopening the intersection will help revitalize downtown. Vote Open spokesperson Brent Bellamy said the poll makes it clear he has a lot more work to do — and repeated his concern it was unfair to put this question to a referendum. "The reality is, it would be difficult to find any public works project that you put to a citywide vote and get the majority of public support. That's just the reality of governing by plebiscite," Bellamy said outside the Bannatyne Avenue office of his firm, Number Ten Architecture. North Kildonan Coun. 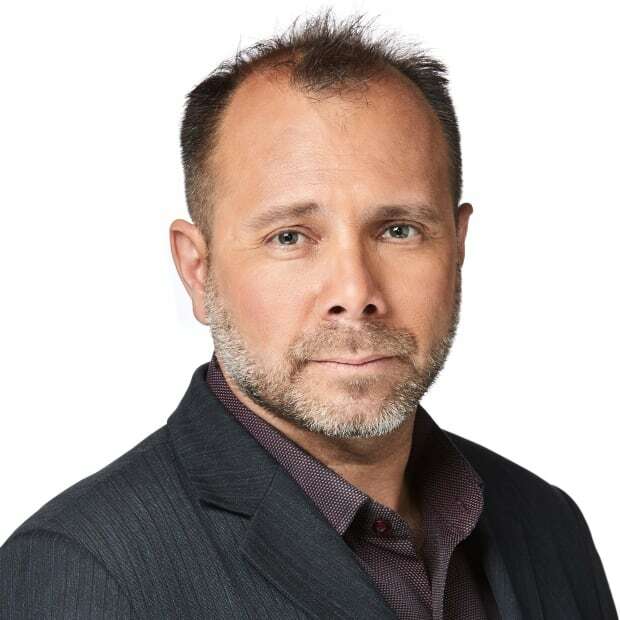 Jeff Browaty, who pushed for the Portage and Main referendum, said the poll's suggestion of 67 per cent opposition to reopening Portage and Main "was in the neighbourhood" of what he expected. "In fact, I thought it may have been even stronger, in opposition," the councillor said in a telephone interview from Halifax. "The doors I've hit, I've had exactly one lady who was in strong support of opening Portage and Main." Mayor Brian Bowman, who pledged to reopen Portage and Main when he first ran for mayor in 2014, said the only poll that matters is the actual vote on Oct. 24. Nonetheless, Bowman, who is running for re-election, repeated his intention to honour the result of the plebiscite. "If ultimately Winnipeggers are saying, 'Not yet, not now,' then we should respect that. At the end of the day, Winnipeggers and voters are always right," the incumbent mayor said outside city hall in an interview. He said his personal opinion remains unchanged in that he believes Portage and Main should be open. "It's an important part of connecting the downtown, creating a much more accessible and more vibrant downtown," Bowman said. Rival mayoral candidate Jenny Motkaluk said the result of the poll was predictable. "I hate to say it, but I told you so," she said. "We know that Winnipeggers understand that opening Portage and Main is not one of our top priorities, and frankly I think it's one of the reasons my campaign gained a lot of momentum in the beginning." The Oct. 24 vote is a non-binding plebiscite. Bowman and Motkaluk have both pledged to honour the results. 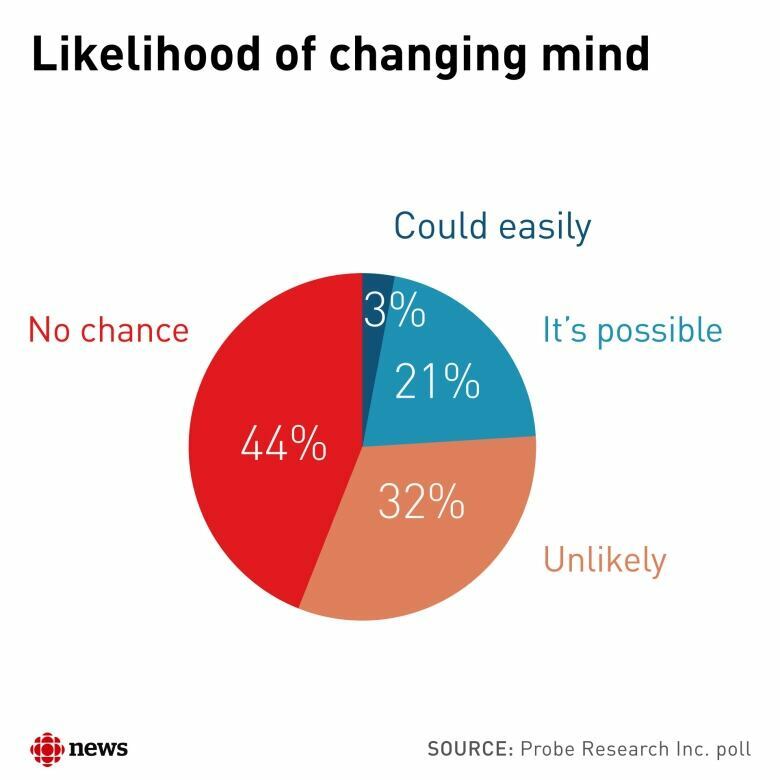 The Probe Research poll also found voters are unlikely to change their minds on Portage and Main between now and election day. The survey found 76 per cent of respondents said there's either no chance they will switch opinions or that such a change would be unlikely. "This is an uphill battle for Team Open," Welch said. "We find that when people do have the information, they do move," he said. "The issue is that we've never had a real discussion about this over the years. It's sort of preconceived notions that everybody has become entrenched in." The Probe Research poll also exposed a skepticism on the part of Winnipeggers when it comes to the cost of major projects. While the poll found only 13 per cent of respondents could identify the price range for reopening Portage and Main — a project pegged at $11.5 million — 73 per cent believed the cost would exceed existing projections.